I can't remember whether it was at my Facebook or blog or Instagram that one of the readers asked if I have tried cooking any eggless or vegan waffles before and I said no. Eggless waffles? No way! I can't imagine waffles without any egg will taste any better!!! On second thought, I asked myself... Am I jumping into a conclusion too fast? Maybe. And so I searched Google for an answer and found many vegan waffles recipe at here, here, here, here, here, here, here, here and more... but are they crispy and fluffy? I'm not sure. Looking at the recipes closely, I noticed that all of these vegan waffles recipes are so different. 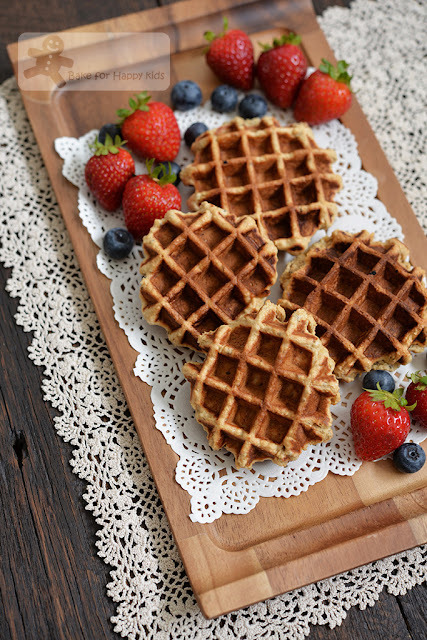 Although most of these recipes try to be healthful by using wholemeal flour and vegetable oil instead of plain white flour and fat that are high in saturated fat like coconut oil or shortening, I have noticed that these recipes have added quite a substantial amount of sugar and oil in order to make the waffles crispy and delicious. With no doubt, I can see the reason of doing that because I can't bring myself to eat any cardboard or soggy unstructured waffles! I like to choose a recipe that uses a moderate amount of sugar and oil but can't decide which recipe to use. So I did an eeny, meeny, miny, moe and simply chose the first recipe that I saw from my Google search and used it to make two types of eggless waffles: 1) wholemeal waffles using plain wholemeal flour 2) gluten free waffles as mentioned in the original recipe by using gluten free flour. Surprise! Surprise! It works!!! These waffles look so amazingly GOOD!!! Amazing! Amazing! 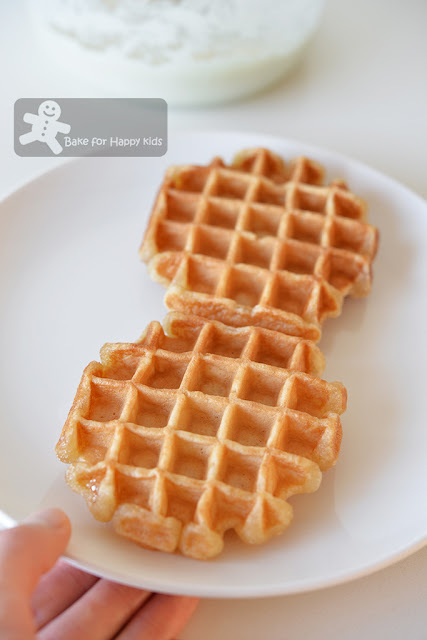 These eggless wholemeal waffles are actually crispy and surprisingly good enough to eat! However, when I said that these healthy waffles are surprisingly good, I wouldn't say that they are as crispy and perfectly good as the ones that I have made with eggs at here, here and here. Hence, I can't deny that the addition of eggs is totally essential to make the best waffles but if you can't eat eggs and like eating waffles for some reasons, you will be happy to know that this is not the end of the world for you. In order to enjoy decent eggless waffles, I would strongly suggest not to skip or cut back of the addition of oil and sugar. Instead, I reckon that you should invest to buy and use good quality and healthful oil and sweetener to make your eggless waffles extra tasty and beneficial!!! With no eggs, the only way to make the waffles fluffy is to add an adequate amount of baking powder. Start by making buttermilk-like almond milk by adding vinegar into almond milk and wait about a minute for the mixture to curd. Then, add oil and agave nectar. Sift in the dry ingredients to aerate the flour but do not discard the wholemeal bits that is trapped in the sieve. Pour them back into the mixture. 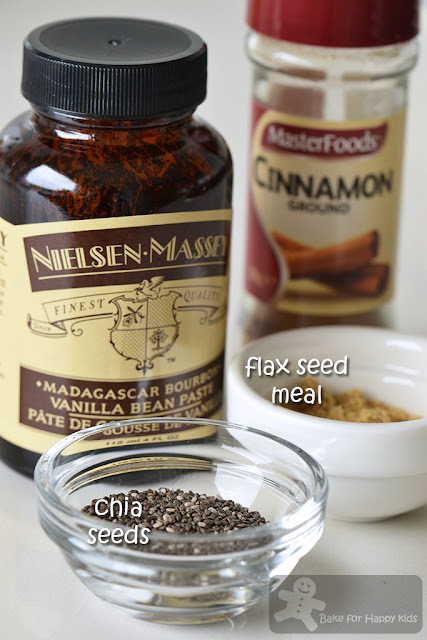 To make the waffles extra tasty or healthy, you can add in these optional ingredients. Mix until just combined. Important: Do not overmix mixture. It is ok that mixture is lumpy. Cook waffles until they are golden brown. Do not under cook the waffles as they will not be crispy and will get stuck onto the waffle iron. See! Although these eggless waffles are not ultra fluffy, they are decent and crispy enough to eat!!! ... but remember you must eat them immediately when they are freshly cooked and warm! ... or they will become too tough to chew! Wait wait... Did I said that I can make these eggless vegan waffles with no gluten too? Yes and so I did according to what the original recipe says... See! It works too!!! Eggless vegan gluten free waffles!!! Although this recipe says that it can make egg free waffles that are gluten free too, I wouldn't recommend making these special waffles unless you have very strict vegan gluten free diet restriction. Why?? ?Although these waffles look golden brown, fully-cooked, well-structured and good enough to eat, they are not exactly crispy but rather chewy to munch. Regardless how long I took to cook waffles even until they are as dark as burnt, they are never as crispy as those made with plain or wholemeal wheat flour. So here we know... gluten in flour is also another essential ingredient to make crispy waffles!!! You can replace almond milk + vinegar with milk + vinegar or just buttermilk. You can also replace agave nectar or maple syrup with honey. 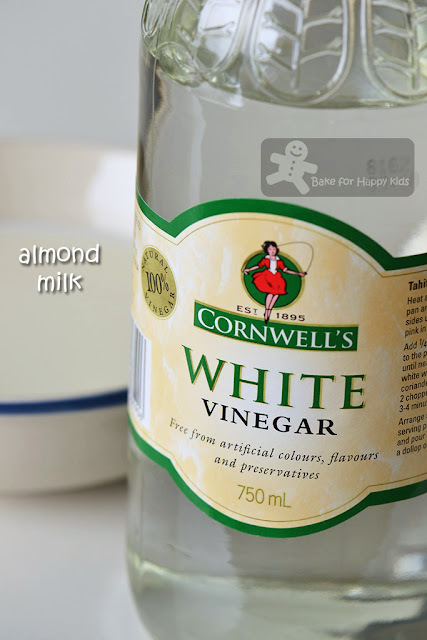 Combine almond milk and vinegar in a mixing bowl and wait about 1-2 mins for the mixture to curd. Add oil and agave nectar or maple syrup and whisk to combine. Set aside. 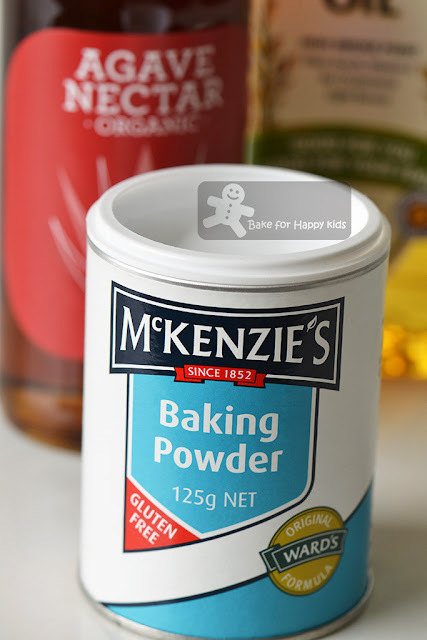 Combine flour, baking powder and salt and sift the dry ingredients into the wet ingredients. 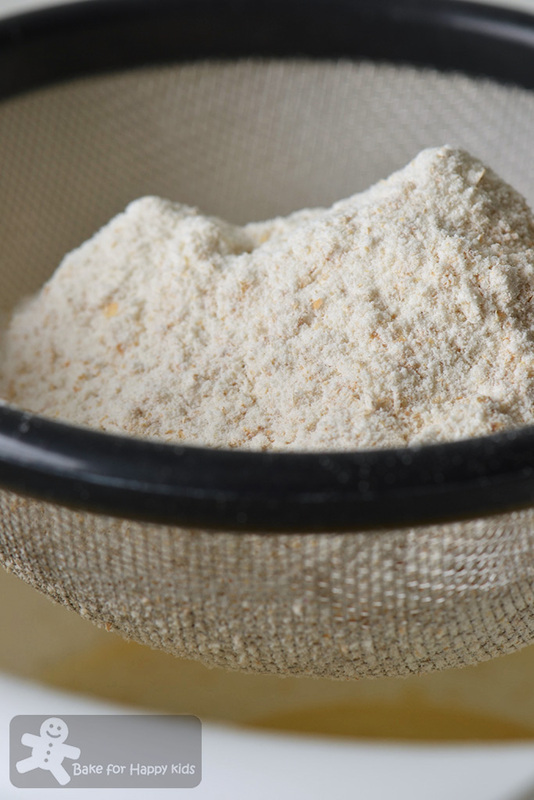 Do not discard the wholemeal bits that are trapped in the sieve and pour them back into the mixture. Whisk until mixture is just combined. Important: Do not over-mix mixture! Preheat a waffle iron to its medium high heat setting. Do not use low heat setting as it won't brown the waffles well. Important: Spray preheated waffle iron with generous amount of non-stick cooking oil spray. 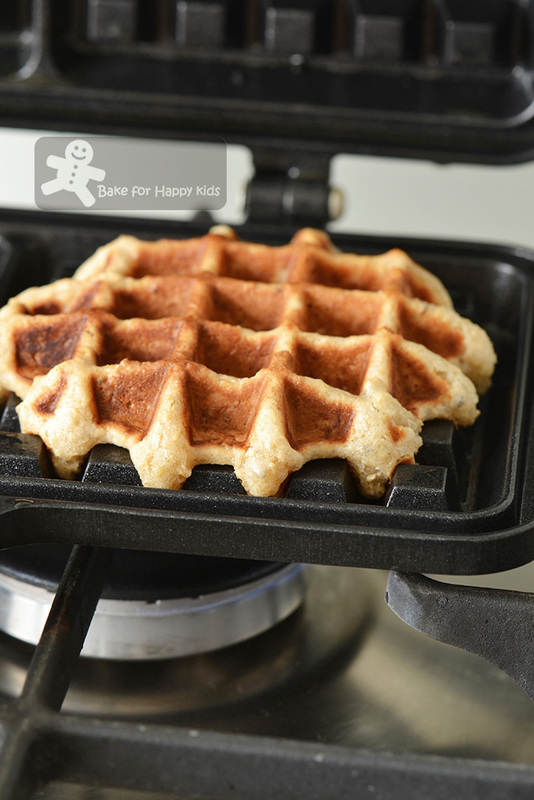 It is a must to grease the waffle iron very well before pouring a new batch of waffle batter as these high in sugar waffles will stuck onto the waffle iron very badly if you don't do that. Caution: If you are cooking waffles on the your stove, please do not spray cooking oil into direct fire! 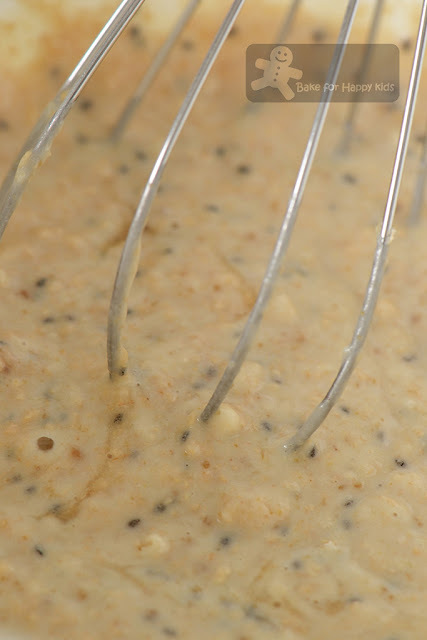 Due to the addition of flax seed meal and chia seeds, this waffle batter will be thick and won't spread very well on the waffle iron. To cook, pour just enough batter (about 1/4 cup) to cover the grids of the hot waffle iron to form free form round waffles to cover the grids. Cook with medium high heat until both sides are crispy and golden brown and is easily removed from iron. If the waffles are not easily removed from the iron, this means that they have not been thoroughly cooked and won't be crispy! Furthermore, under-cooked waffles are very yucky to eat!!! LOL! Repeat this step until all the batter has been used. Serve immediately on its own or with extra agave nectar or maple syrup if you wish. These eggless waffles are the best when they are freshly cooked and served immediately. If you can't do that, you can keep the freshly cooked waffles in 120°C oven while you are cooking the rest of them but do not leave the waffles in the oven for more than 15 mins as the waffles will dry up to form a cardboard like texture after prolong period of heating! Please do not keep or re-heat these waffles if you can't finish all within the next 20-30 mins after cooking as they will become too tough (the wholemeal ones) or rubbery (the gluten free ones) to chew. These waffles look really really good. Bet my kids will love it too. Hi Zoe! Love to read your baking posts, always get me inspired to try! I am thinking of buying a waffle maker to try making waffles. I really love the nice aroma of waffles! Any advice for a good waffle maker brand? How do you wash the machine?? This is what holds me back as those grids on the waffle iron look difficult to wash.... Thank you!! Nice to know that you like my baking posts. My waffle pan is the stovetop cheap cheap no brand type that I bought when I was in Korea and has worked very well for me. My brother gave me a nordic ware waffle pan which is good too but it makes waffles that is too big for us. This little one is still the best. Washing is easy. Just soap and water at the sink! No grease and no worries! Sorry that I don't have a particular brand that I can recommend. 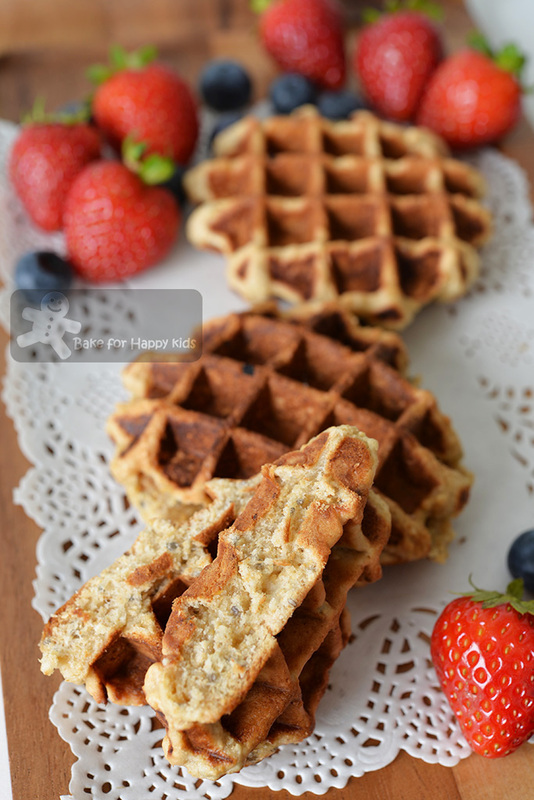 Healthy and delicious vegan waffles ...!! !